In stock now at Forsyth, New Ballas and Rock Hill. Should hit all of our stores today. Won't have time to get it online, but we have a good supply. We are also tasting it tonight! Snake Oil is a Red IPA brewed with combination of American and Australian Hops. 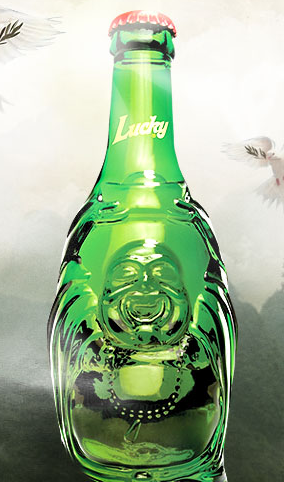 It has a bright , complex aroma with notes of citrus, peach, and tropical fruit. A variety of caramel malts lend this beer a full body and big mouthfeel. Snake Oil is a delicious Red IPA brewed with Citra, Simcoe, Galaxy, and Amarillo hops! 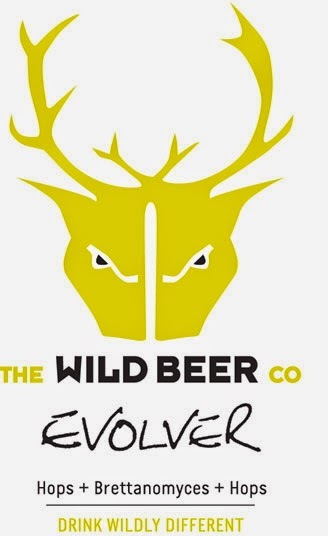 The exploration of yeast strains and the different results we can achieve are beautifully exemplified in Evolver, a pale ale with a difference. 100% fermented with brettanomyces, a naturally occurring wild yeast. For the first 3 months the beer tastes the same as a fresh pale ale, then the differing flavour compounds start to shine through after 6 months the brett really takes hold. This is a beer that can be drunk fresh, as a normal pale ale should be, or left to evolve and mature into a unique and unusual beer. We just gave away 2 tickets through a random drawing of our BRC members. Jeff W. won a pair of tickets! Mike H. won a pair of tickets! Slightly moorish, sweet spice finish complimented by woody undertones. "Ripe black cherry and blackberry flavors pick up accents of rosemary, mineral and spice in this red. 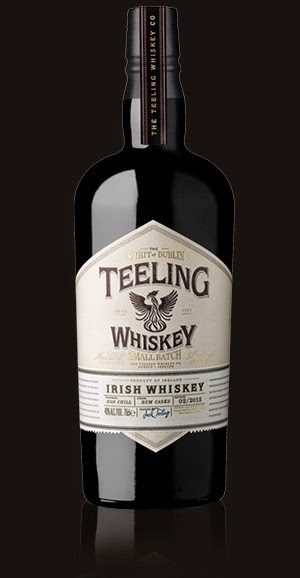 Concentrated and intense, fresh and focused, leaning toward black currant and cedar notes on the solid finish. Racy midpalate. Cabernet Sauvignon and Cabernet Franc. Best from 2017 through 2030." Type of soil: The land on which the vineyards have different morphological characteristics and composite with a strong presence in areas rich in clay and limestone rocks and partly of clay; are located at an altitude of between 100 and 300 meters s.l.m., facing west / southwest. Climate: The climate of 2011 was great for the viticulture of Bolgheri. It can be counted among the best vintages of 2000. winter was hard with temperatures below the seasonal average, especially in the months of November and January. Spring is instead started early with mild temperatures and excellent water supply with no gradual rains accompanied by wind. These conditions weather favored an excellent vegetative growth of vines. The summer of 2011 was hot and long, but with temperatures that are always indented between the averages seasonal, except in mid-July when the heat became more intense. Fortunately the temperature between night and day, favored by the proximity to sea ​​has prevented the onset of water stress of plants and phenomena ripening of the grapes. 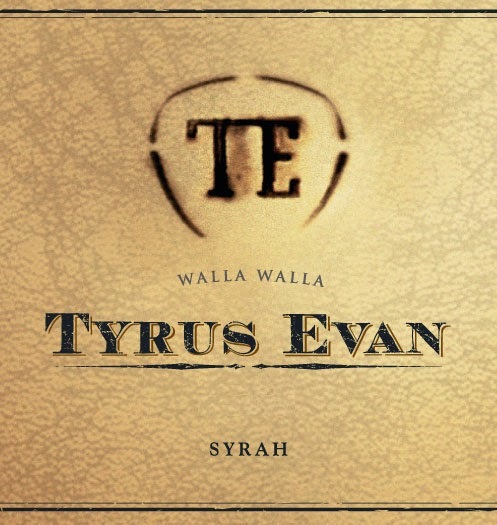 From Super-Star Wine Maker Ken Wright, a small production Syrah at half price Only 512 Cases Made. Rich, ripe and round, offering a broad mouthful of cherry, blackberry, cola and black tea flavors that come together into a deftly balanced whoosh of a finish that shoots through effectively and lingers effortlessly. Inky purple. Pungent, smoke- and spice-accented aromas of black and blue fruits, licorice, vanilla and violet. Fleshy and broad on entry, then tighter in the mid-palate, offering sappy blueberry and black raspberry flavors and a zesty touch of cracked pepper. Closes on a sweet note, with impressive energy and slow-building tannins. I'd give this one at least another five years of bottle age. 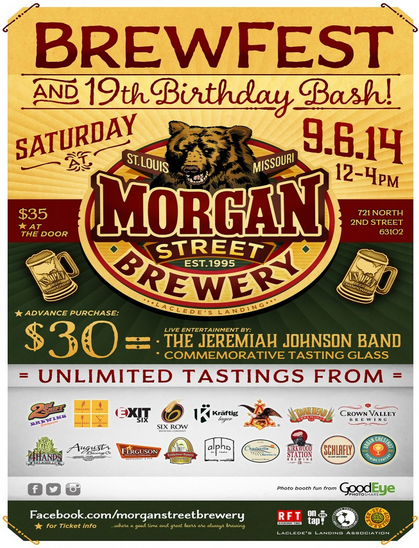 Schlafly Hop in the city is always one of the great beer festivals in St. Louis. They are celebrating their 16th year of Hop in the city. Periodically we will give away tickets and other items to our BRC - BREWard club members. We just randomly drew the name Brian R. from our top 150 people in the BRC and he got 2 free tickets to Hop in the City this year! Congrats! 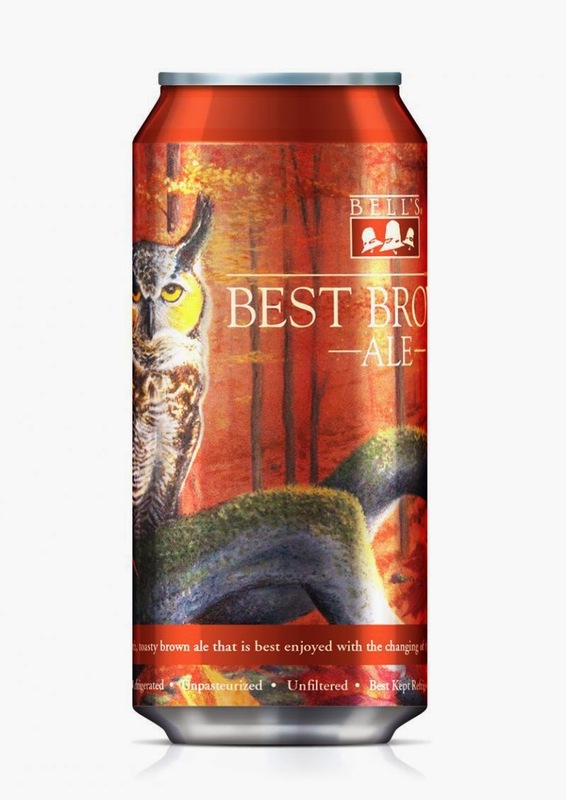 Bells Best Brown Ale in CANS!!! 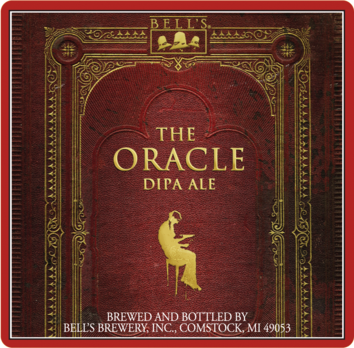 TASTING NOTES: The first release in Bell’s Planet Series,Mars (The Bringer of War) is a double IPA with a complex hop character and a malty backbone. Notes of tropical fruit, citrus, pine, lemon, lime and pineapple are all present in both the aroma and flavor. Hopped at a ratio of about 3.4 pounds of hops per barrel, the recipe for Mars was developed from a trial batch called Larry’s Latest Double IPA brewed in our original brewery located adjacent to the Eccentric Café in downtown Kalamazoo. The Montagnes’ 2010 Cotes du Roussillon Sabina as usual showcases Grenache, though here the complimentary young-vines Syrah amounts to 30%. There is infectious juiciness and invigoration from seedy red and black raspberries – mingled with beet root and laced with a hint of horseradish for a borscht-like effect – in the context of formidable sheer intensity. But that is not to say that nuance is left behind. Iris and violet on the nose proceed to waft through the entire proceedings, while crushed stone and saline suffusions serve for counterpoint and saliva-liberation on a long, energetic and dynamic finish. This effusive and polished performance should remain captivating – not to mention offer outstanding value – through at least 2016. "The rich talents of the 1940s Chicago blues scene pioneered the amplified guitar inspiring classic rock music. We celebrate their legacy of originality with an original of our own. 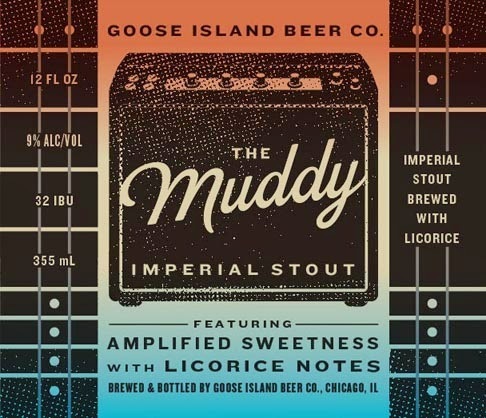 A rich imperial stout amplified with an unexpected sweetness and complexity. We teased you with the Cherry Funk label a while back, but now it’s almost time to taste the magic....Cherry Funk is a sour ale that has been aged on cherries, and has an ABV of 7.5%. The end results are dry and sour with tart cherry flavor and aroma. 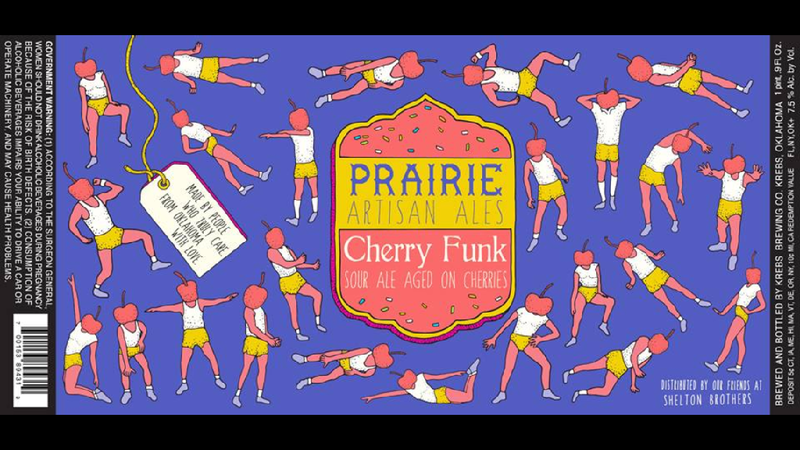 Unlike some fruit beers that are syrupy and sweet, Cherry Funk is complex and on point with Prairie’s farmhouse point of view. Mark your calendars, you won’t want to miss this one. Barrel Aged Version of the regular PannepotIn the early 1900s, the village of De Panne, close to the French border, was famous for two things — the ‘Pannepot,’or fishing boats, that could be seen along the coast, and the unique dark ale enjoyed by the local fishermen. Our Old Fisherman’s Ale is a tribute to these hardy sailors and their rich, flavorful brew. Pannepot is an unfiltered, unpasteurized, bottle-conditioned dark ale with an intense, complex chocolate malt aroma, roasted accents, and subtle hints of spice. BRC emails just sent out. A sour collaboration with Crooked Stave aged in Cognac Barrels. Sour ale fermented in fouders with 3 strains of brettanomyces, aged in cognac barrels 11 months with a funky bunch of bacteria. "What would a beer fermented in oak foeders taste like if it were not for Brettanomyces? I can't tell you...and I'm not sure I'll ever find out. This creation, which brings together Anchorage Brewing Company and Crooked Stave Artisan Beer Project, is an amalgamation of Brettanomyces, Oak Foeders, and an extensive aging period of 350 litre French oak Cognac barrels with a funky bunch of critters. I hope your mind is wandering as much as mine is, because it takes passion, devotion and a lengthy time waiting for a creation such as this. 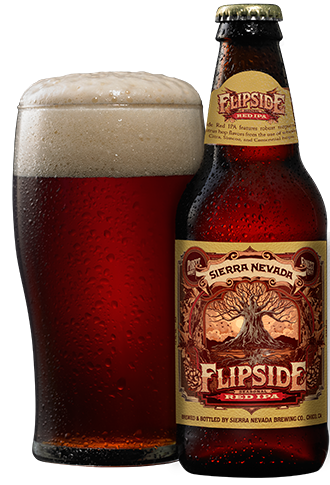 Enjoy this beer as you would a fine wine, swirl it around in your glass and revel in its beauty. Let the beer open up as it slowly warms and reveals all the subtle nuances from the temperament of the yeast to the elevated barrel characteristics. Saison brewed with lemongrass and citra hops. Fermented and aged in French oak wine foudres with brettanomyces and saison yeast. Dry hopped with citra hops. Bottle conditioned for natural carbonation.